Monday, March 30 1908 -- Sportwriter H.M. Walker and George Herriman take a trip out to see the doings at the Los Angeles Revolver and Rifle Club. Believe it or not, this organization still exists today. In weazel-skin hat news, yet another guest has left the party, and the mysterious thirteenth guest once again doesn't make it inside. Copyright renewed (c) 2013 Russ Morgan. All rights reserved. 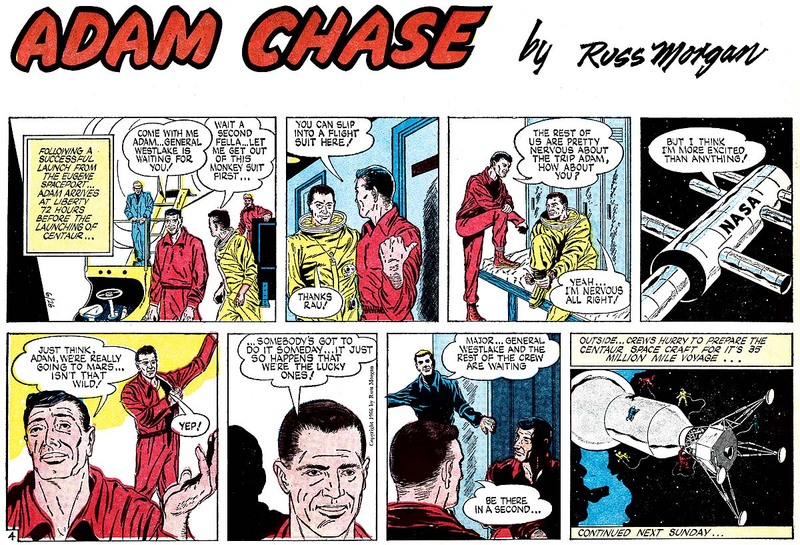 Adam Chase strip #4, originally published June 26, 1966. So cool! My Dad's old strip...I remember leafing through the book containing all of these strips as a child...it's great to get to see them again! I'll be checking in every Friday! The marriage of Harry B. Martin, a well-known newspaper cartoonist, and Miss Susie Flanders was quietly solemnized at St. John’s Episcopal Church, Dolman and Hickory streets, at 11 o’clock yesterday morning. The ceremony was performed by the Reverend C.N. Molier, rector of the church, and was witnessed by a few relatives and friends of the young couple. At noon Mr. and Mrs. Martin started to New York. They will return to St. Louis in a short time. ...The Weatherbird is a Post-Dispatch tradition, and the oldest continuously running daily cartoon in American journalism. The first Bird was published Feb. 11, 1901. Martin came up with the Weatherbird while on a trip when he saw comical photos of young birds with gaping bills. The Warsaw Times-Union (Indiana), April 16, 1959, said, “…One of the early comic strip cartoonists, he gained his nickname from the cartoon he drew for the St. Louis Post-Dispatch titled ‘Dickie Bird.’” In 1903, according to Society for News Design, Martin moved to New York City, where he produced the strip, It Happened In Birdland, that started in April 1907 and ended in September 1909. In 1920 the family of four resided in Manhattan, New York City at 538 149 Street. He was a cartoonist and writer. 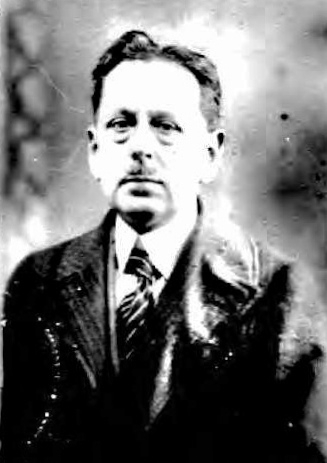 His 1920 passport application revealed that he was a New York Globe correspondent on assignment to cover golf in England and France, then traveling to Belgium. The 1925 state census recorded the family in New York City at 344 West 72 Street. Martin had four years of high school and worked as an editor. Their next address was 340 West 72 Street, according to the 1930 census. Martin was still an editor. He has not been found in the 1940 census, but his wife and daughter lived at 240 Waverly Place since 1935 and possibly earlier. ...He leaves his wife, Mrs. Susie Flanders Martin; a son, Gould B. Martin; a daughter, Mrs. Doris V. Parks, and two sisters. Please leave your questions here in comments. Gene Carr, one of the real workhorses in the Pulitzer stable in the 1900s-10s era, put yet another notch in his brush with Mister Al Most. The series debuted on December 10 1911, and starred a fellow who always seems to be about to do well for himself, but then the tables are turned and others take credit for his ideas or he becomes a goat. This was certainly not a particularly original idea for a series, but Carr did add an element of interest when he began a continuing story about Al proposing to a girl, Dolly, thinking that she is rich, and then finding out she isn't. Al's mission, then, is to get her to break the engagement, which turns out to be a surprisingly tough task, and takes the rest of the series. Does he ever succeed? 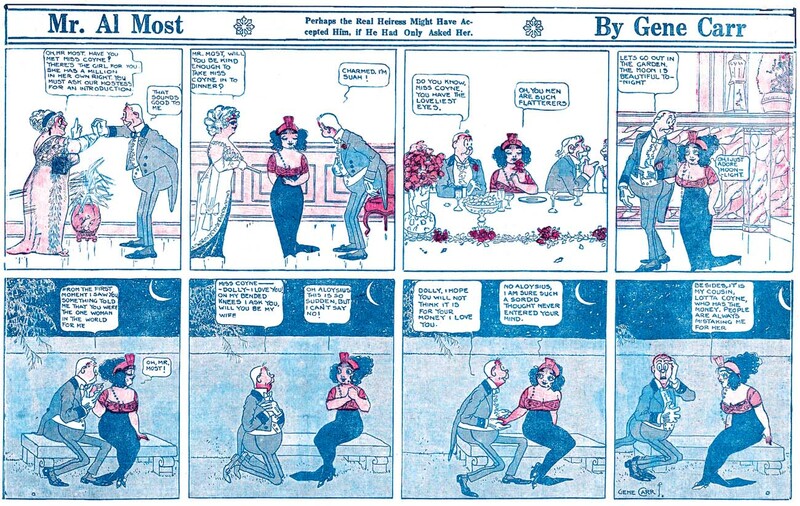 Unfortunately we don't know because the situation remains unresolved as of the last strip, which ran in the October 13 1912 Funny Side section. Thanks to Cole Johnson for the scans! If you like Mr. Al Most, it looks like Barnacle Press has the whole run available. Charles Wellington Wessell was born Charles Alonzo Wessell Jr. in New York on October 12, 1899. His birthplace is in the census, and birthdate is on his World War I draft card. In the 1900 U.S. Federal Census, he was the youngest of two children born to Charles Alonzo, a jeweler, and Florence. His name was recorded as “Charles Jr.” The family lived in Burlington, New Jersey on High and Broad Streets. The 1910 census recorded the Wessell household of six in Brooklyn, New York at 300 Carleton Avenue. His paternal grandmother and aunt were there. On September 6, 1918, Wessell signed his World War I draft card; his middle initial was “W”. He resided with his parents at 129 East 40th Street in Manhattan, and was a “newspaperman” for the New York Evening World. His description was tall, slender with blue eyes and brown hair. He was listed in the History of Battery “C”: 148th Field Artillery, American Expeditionary Forces (1919). 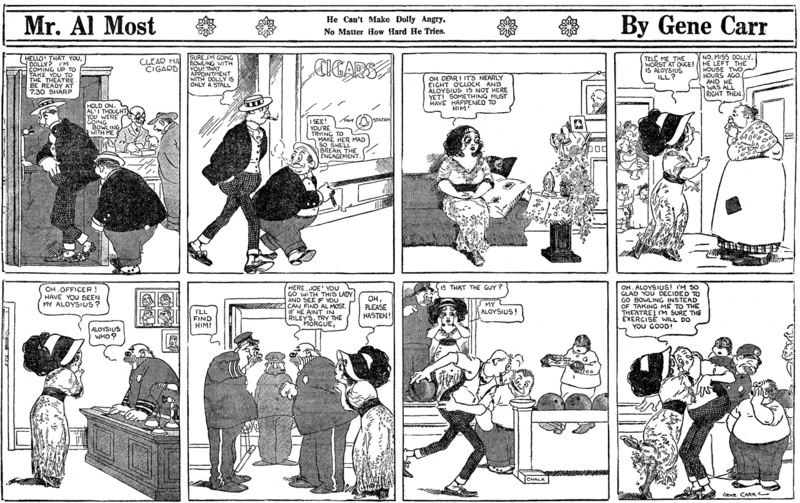 His strip Leave It to Lou began in the New York Evening World June 10, 1919 and ended June 25, 1921. He and his parents were at the same address in the 1920 census. His middle initial was “W”; the reason for the middle name change is not known. He was a newspaper cartoonist and his father was a real estate broker. Wessell had an entry in the Maryland Conservationalist, Volume 17, Issue 4, 1924: “Charles Wellington Wessell, conservationist and sportsman; American director in North American Game Breeders Association and chairman of the National Committee on Game Bird Standards; formerly chief of the Division of Game…” He illustrated Julius King’s book, Dogs, which was published in 1927. Charles Wellington Wessell of Doylestown, Bucks County, has been appointed Chief, Division of Propagation and Game Farms…. Mr. Wessell, whose experience in game propagation and research qualifies him for the post, has written many articles on rearing game and has developed two of the best strains of pure Mongolian and Melanistic Mutant pheasants in the country. He is also known for his knowledge of game bird standards and methods of releasing and restocking. A former newspaperman and veteran sportsman, Mr. Wessell has worked ardently during recent years to bring about a better relationship between landowners and sportsmen, and has assisted many fish and game associations in their distribution and management of game. According to the 1940 census, he lived in Doylestown, Pennsylvania, with his wife Thea, a German emigrant who was naturalized February 24, 1937. He had one year of high school and was a game farmer. Some of his comic book credits are at the Grand Comics Database, Michigan State University Libraries Special Collections Division, and Who’s Who of American Comic Books 1928–1999. Doylestown, Pa., July 12–(UP)—Charles Wellington Wessell, 46, former state director of game propagation, was killed last night in the collision of his auto and a coal truck on Route 202 here. A commercial artist and writer for sportsmen’s magazines, Mr. Wessell was appointed to the state post by former Gov. Earle in 1935. State Police said that Mr. Wessell’s car and the truck driven by Fred H. Selmon, 36, Trenton, sideswiped while traveling in opposite directions, overturning the truck. Selmon was held in $000 bail pending a coroner’s investigation. His wife passed away in August 1982. Hi -- love your blog! 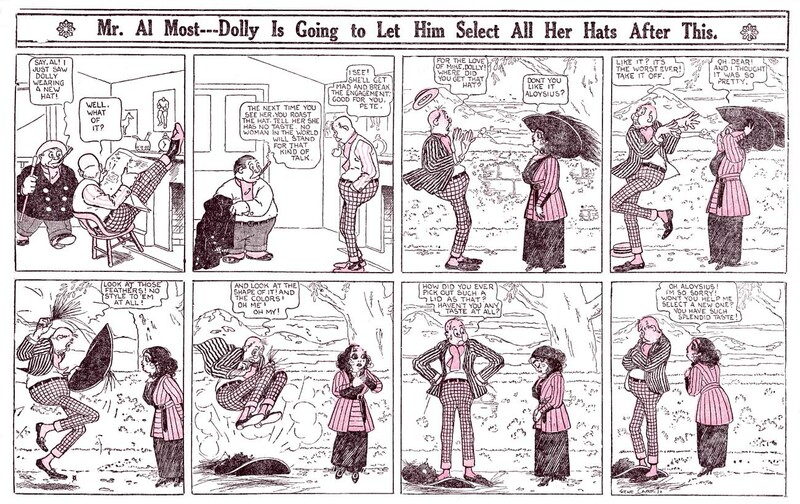 Do you know if there is a name for the reaction of characters in old strips where, in response to a punch line, a character jumps out of his shoes, falls backwards, etc. Like a spit-take on TV. thanks a lot! I've most often heard that referred to as a "flip take," but that might be a modern term. An older term for such strips is "plop gag" strips. I have a theory that TAD Dorgan may have invented the flip take, but Bud Fisher is a possibility, too. The real master was Walter Hoban, whose "Jerry on the Job" strip was notorious for incredibly energetic plop gags. The contemporary master of the plop gag, in my opinion, is Kaz, who uses it a lot in his wonderful "Underworld" strip. I imagine Mort Walker names that comic strip convention, as he does many others, in "The Lexicon of Comicana". I'd tell you WHAT he calls it if I could find my copy at the moment. Which I can't. C.W. Wessell seems to have come on board at the New York Evening World to take over the spots of vacationing cartoonists in the summer of 1918. At least it is from this berth that all but one of his known comic strip series originated. None of his 1918 strips, though, lasted more than a few weeks while the regular cartoonists were away (but as we'll see in tomorrow's Ink-Slinger Profile by Alex Jay, there was good reason Wessell didn't continue them). Leave It To Lou was another summer replacement, but it began a year later, taking over the spot left open by the vacationing Maurice Ketten on June 10 1919. Unlike Wessell's 1918 efforts, this one 'had legs'. When Ketten returned from vacation, Wessell was given his own space in which to continue the feature. Leave It To Lou was, perhaps depending on reader preconceptions, either a strip about a dim-bulb girl who innocently says insulting things, or one about a young woman with a quick and acid tongue who is smart enough to get away with her zingers by pretending to be a feather-brained innocent. I favor the latter interpretation, but you really can go either way. I think that duality made the strip popular to a wide audience, and saved it from the end of summer chopping block. 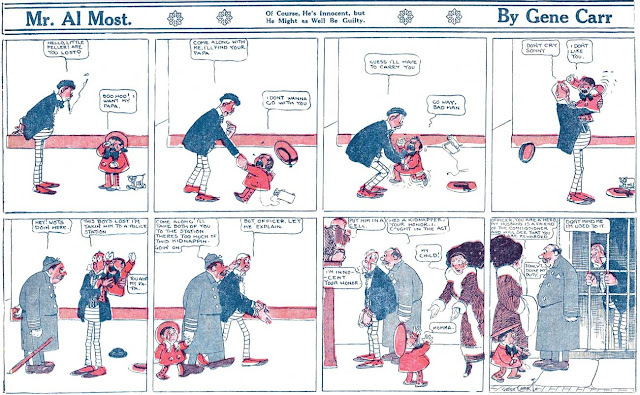 Wessell's strip ran until June 25 1921, a very respectable run for a feature that was originally created simply to fill an empty hole on the page. 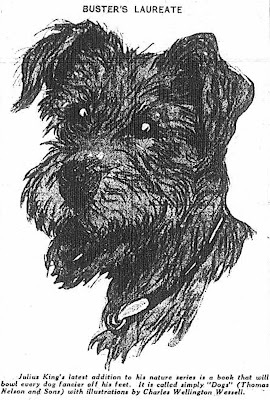 With the end of Leave It To Lou, unfortunately, that seems to have been the end of Wessell's newspaper cartooning career, despite cartooning and writing abilities that were above par. I've wondered about that. I have some of the Star's books of editorial cartoons for the '48 and '52 and '56 elections, with the last handful of Cliff and the first batch of Jim (along with Gib Crockett). This was right around the time the Post bought the Times-Herald, and shoved the Star aside to be #1 in Washington.